Support for compressed Vista icons. More about Vista icons. Open and extract icons from applications including the 256x256 PNG images in icons. Save Vista icons and convert Vista icons to XP icons. When saving an icon, user may select whether to compress images in icon or not. A Projected Shadow edit tool lets you easily create shadows like the ones found in Vista icons. Reflective surfaces are supported in 3D editor. Image to icon wizard is able to create icons with multiple custom image formats needed in DPI-aware applications. Both 32-bits and 64-bits editions are available on the Downloads page. Windows Vista actively supports the use of high-DPI displays. 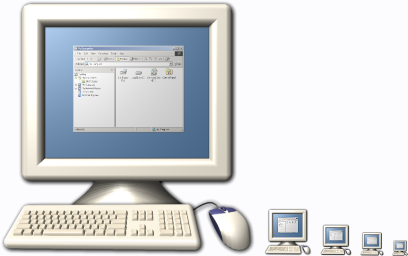 Vista compatible applications are recommended to follow the example given by the OS and implement correct DPI scaling. 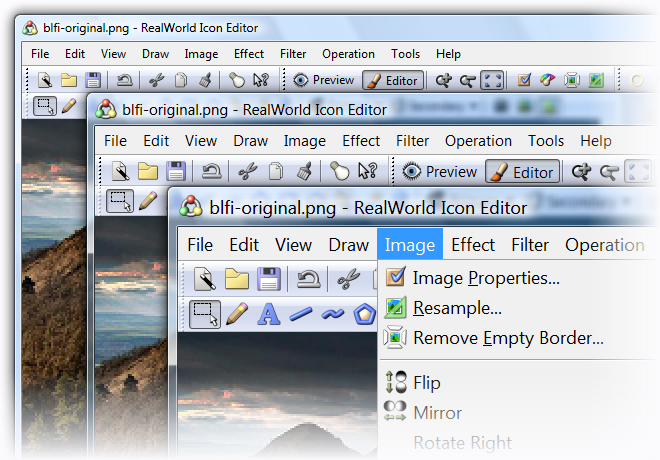 RealWorld Icon Editor is a fully DPI-aware application featuring optimized graphics for 96, 120, and 144 DPI modes. Application graphic elements are available in multiple resolutions. 1280x1024 display is recommended for 120 DPI mode and 1600x1200 for 144 DPI. Beside DPI handling, RealWorld Icon Editor also works correctly with User Account Control (UAC) enabled. An icon can be saved without compression (Win XP), with large images compressed (default Vista format) or with all images compressed for minimum file size.